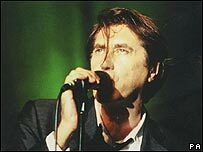 Singer Bryan Ferry has apologised for an interview in which he praised the iconography of the Nazi party. The UK star is reported to have told a German newspaper that the "mass marches and the flags" of Hitler's regime were "just fantastic - really beautiful". Jewish leaders in Britain condemned the comments, and called for Marks and Spencer to drop Ferry as a model. "I apologise unreservedly," the singer said in a statement, adding he found the Nazi regime "evil and abhorrent". According to press reports, the 61-year-old told the Welt Am Sonntag newspaper last month: "The way that the Nazis staged themselves and presented themselves, my Lord! "I'm talking about the films of Leni Riefenstahl and the buildings of Albert Speer and the mass marches and the flags. Just fantastic - really beautiful." Riefenstahl was a German film-maker who became notorious for her Nazi propaganda films. Speer was Adolf Hitler's chief architect and minister for armaments during World War II. "We do welcome the fact that he has issued a swift comment that there was no intention to condone the Nazi regime," said Jeremy Newmark, chief executive of the Jewish Leadership Council. "Nevertheless, his choice of language was deeply insensitive," he added. Lord Greville Janner, vice-president of the World Jewish Congress, told Reuters news agency: "His apology was total, appropriate and absolutely necessary. "I hope that he will never make the same mistake again."